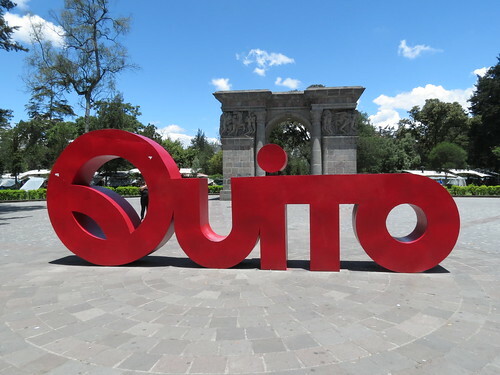 Head High Heart Strong: Quito, I Quit! The other day I dusted off my little notepad I kept while we travelled as some friends are off to Colombia shortly, I'm so very envious and the more I read back, the more that came rushing back to me. Sometimes those memories fade away so quickly when you're back to normal life doing normal jobs and paying rent! I have to say, I can't believe where this year has gone, it felt like only yesterday that I got caught up in the whirlwind of being offered a job in Norwich, and everything fell into place, I moved into our lovely little house and shared it with our landlady for a month before Nick and Kelly joined me in August. Now, we're coming into our last month in the house, and I'm packing up all my things again! We left the jungle of Misahualli at completely the wrong time, and coming into Tena and then onto Quito we realised this. 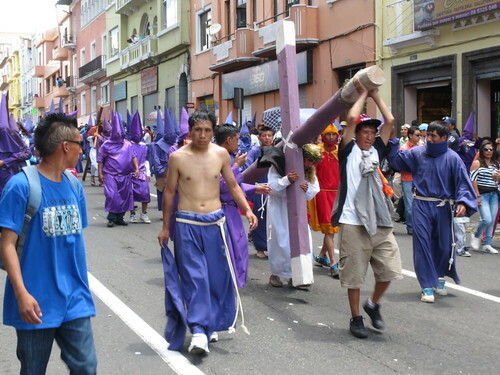 It was the beginning of Semana Santa, which is their Easter celebrations. The bus terminals were completely manic and we arrived into Quito about 9 in the evening after travelling all day. We took a taxi to the newer part of Quite, Mariscal, which took 40 minutes because of all the traffic. We decided to stay at Backpacker's Inn, a friendly little place run by a lady called Lilly and totally made you feel like you were staying the house of someone's abuela. We dumped our bags and immediately went looking for food.The streets were so busy due to the national holidays. The main square was illuminated with lights and had hundreds of restaurants. This was far too contrasting from where we had woken up that morning, so we escaped off the main route and found a really nice little Mexican called Tarzan's where I had shrimp burritos and a mojito. I remember being slightly perplexed by the restaurants there as none of them had any front walls, just metal shutters they rolled up when the restaurant was open, meaning it was freezing inside! The next day we washed our stinky jungle laundry and tried to get tickets to escape Quito as we had really had enough of cities by this time, but due to the holiday it was ridiculously busy, the queues were so long they led all the way into the street. Other travellers were running up and down the line, looking for foreign faces to try and get a group together to afford a taxi. Unfortunately we couldn't join in as we had left our bags back at the hostel. We decided to explore the town and hope that the crowds died down a little later. In the town centre there were hundreds of people heading in one direction so we decided to follow. 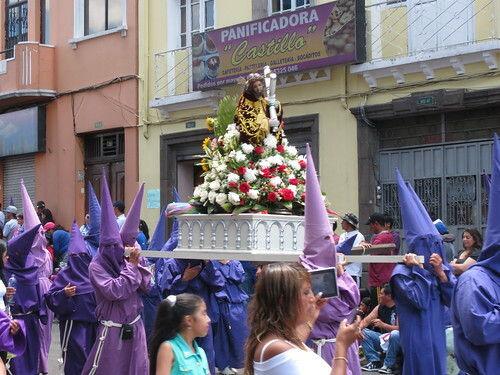 They led us to the Basilica where there was a procession for the holy week. 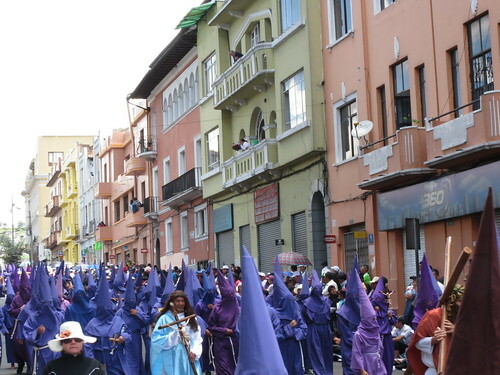 Everyone involved was wearing a purple tunic with a pointy purple hood with just two holes for eyes, they had chains around their wrists and ankles and some of them carried huge logs or crosses. In the midday heat they all looked uncomfortable and it all got a bit too much stood amongst the crowd, so we ducked out shortly after. We got some food and this was the first time I ever tried coconut water. On every street corner there were people with little metal trollies filled with coconut water and ice, it was so delicious, we unwound in the square for a little, and escaped the madness of the city on the trolebus which took us to the botanical gardens. This was slightly eerie as there were lots of people working there, but it looked so run down and dried up and shrivelled. Nick tried out one of the worst toilets we'd witnessed so far, and we escaped back to the hostel. 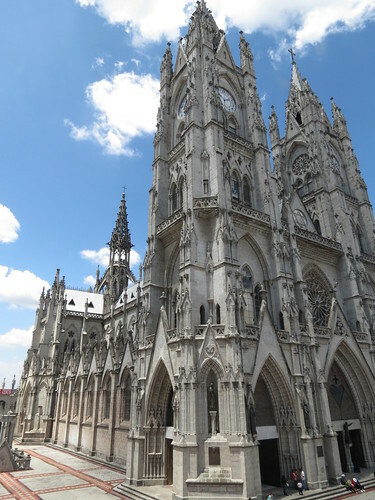 When we got back, we explained to Lilly our problem with the transport, and she cut a deal with us, and made her son and her son in law drive us the 1 1/2 trip to Otavalo, a little market town in the North. The guys didn't seem to mind, in fact they seemed to enjoy the temporary new found freedom, and laughed and chatted with us all the way there, again showing us how amazingly friendly the Ecuadorian people are. They dropped us right at the door of our hostel in Otavalo, and even got out to have a nosy around and swap some business tips with the manager of our new hostel. Quito may not have won us over, but the people definitely did!